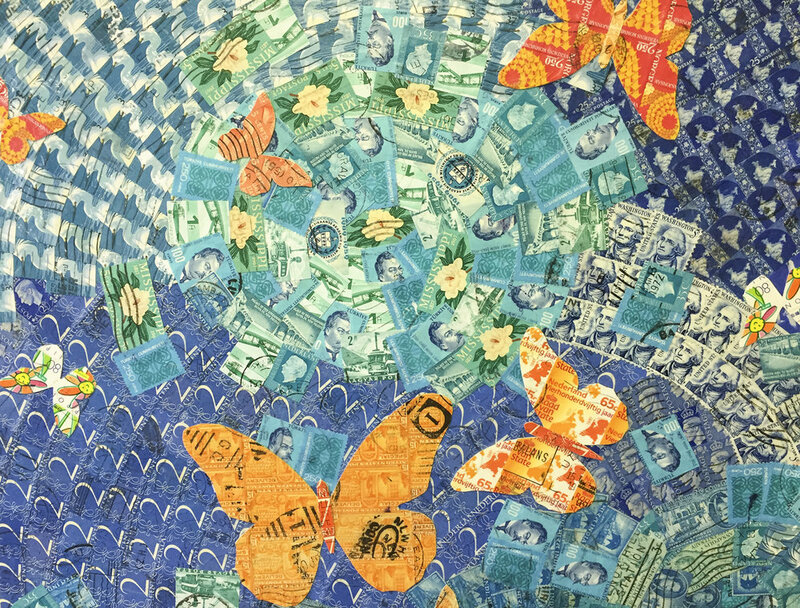 Fostering discovery through commissioned mosaics made from postage stamps. 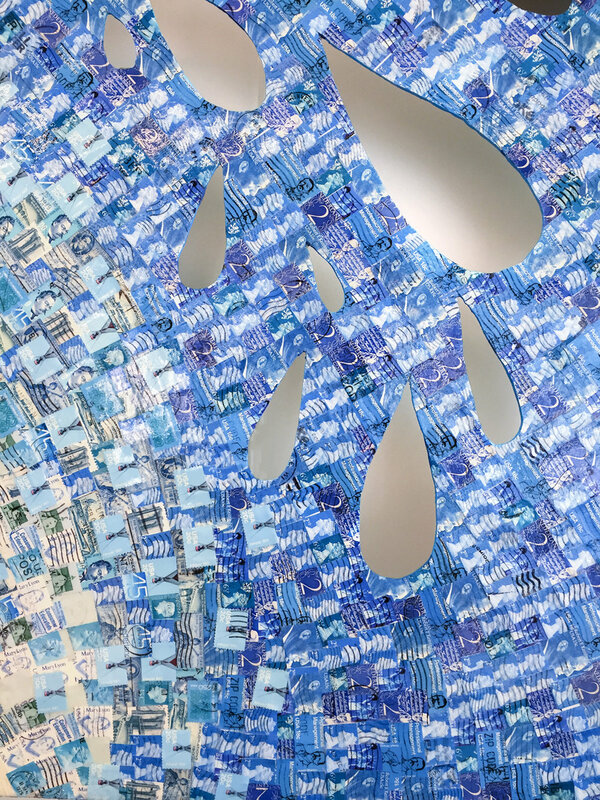 "L'Enfant Sky", 160"L x 46"H x 2 1/2"D. Postage stamps on aluminum. L'Enfant Plaza, Washington, DC. 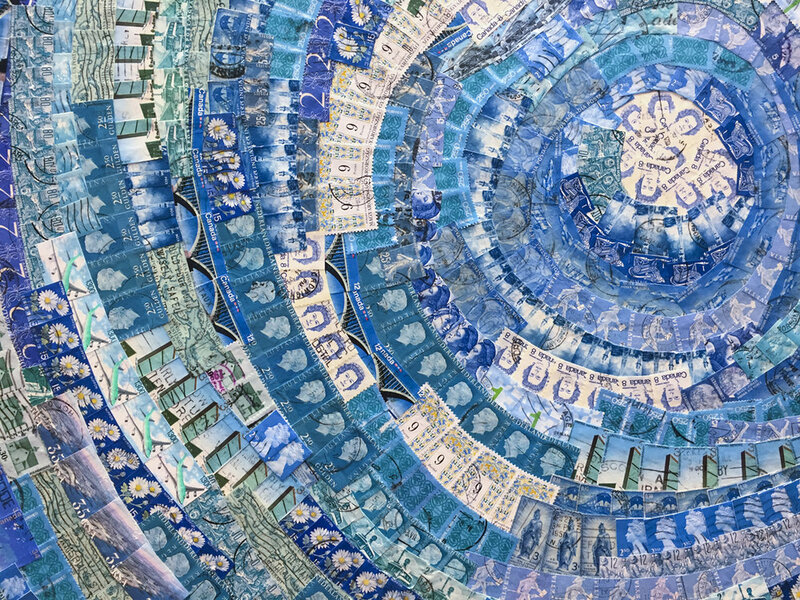 Detail of "L'Enfant Sky”, 160"L x 46"H x 2 1/2"D . Postage stamps on aluminum. L'Enfant Plaza, Washington, D.C.
“Promenade in Blues, Reds and Greens”, 166.5”L x 74.25” H x 2 ½”D (average of jagged edges). Postage stamps on aluminum. L'Enfant Plaza, Washington, D.C. Detail of “Promenade in Blues, Reds and Greens”. "Dreams" at the Dayton Children's Hospital (Dayton, Ohio). 40"H x 60"L x 3"D. Postage stamps on board. Inspired from an aerial view of Austin, Texas. The mosaic is made of two sections with a negative space that creates the Colorado River. 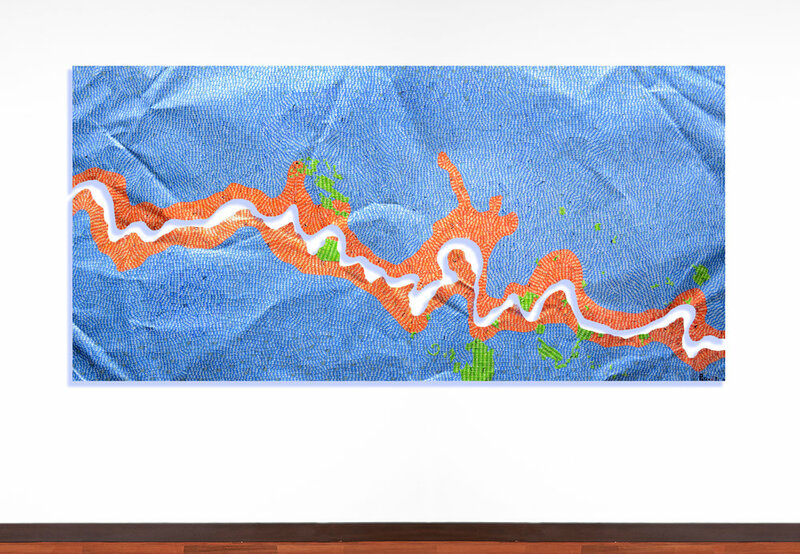 Its the most vibrant, colorful piece I have created in a long time.The green areas are Austin parks and recreational areas. To emulate Austin's terrain, the stamps were applied in a fluid way. Map of "Washington, D.C. and Baltimore" in the Medstar headquarters lobby (Columbia, MD). 52"H x 192" x 3"D. Featuring American medical stamps with international postage stamps on aluminum. Detail of map of Baltimore. "Colorado River" as it flows through Austin, Texas. 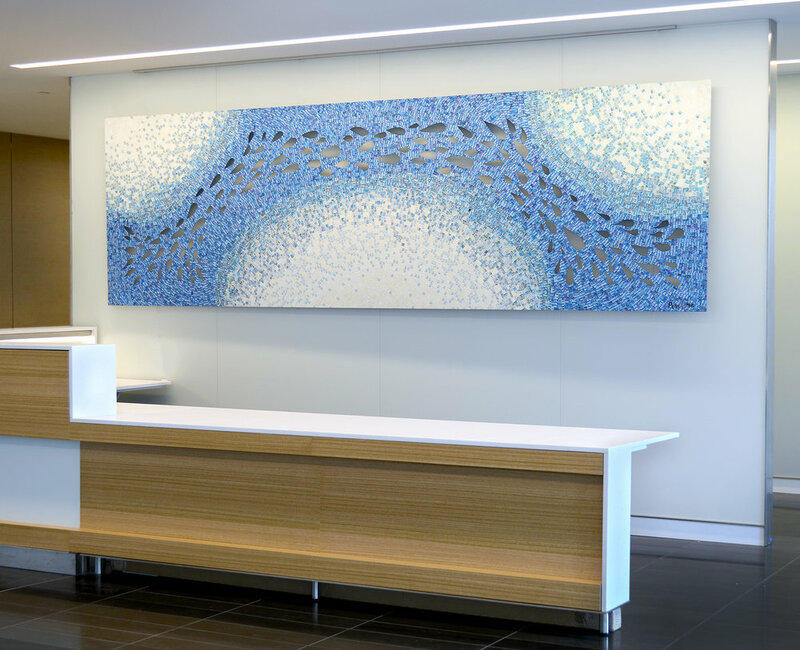 84"H x 240" L x 2.5" D, postage stamps on aluminum. Wall sculpture at the new Marriott Hotel in Bellevue, Washington. 48" x 229" x 2.5", postage stamps on aluminum. Detail of the Marriott Hotel in Bellevue, Washington. THEIR STORY: Always under attack. Always vigilant. ART INSPIRATION: I wanted to give the feeling of always being under threat. Do you have a question for Peter or would like to receive updates about his new work? You can easily reach him through the form below. 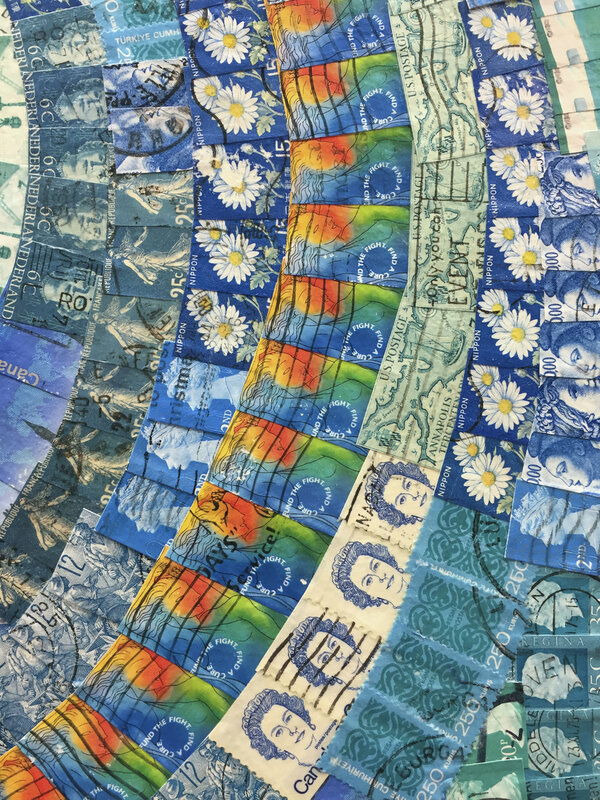 postage stamps on aluminum, 60" x 60"
Detail of "Map of Honor". "Aerial Landscape of Farmland", near Fort Worth, Texas. 115.5" W x 54" H. Postage stamps on board. Detail of cloud formation in "Aerial Landscape of Farmland". "Nature Reclaims a Golf Course" 59"L x 36"H, postage stamps on board. Detail of Cardinal in "Nature Reclaims a Golf Course". Hélène at two or three years of age. Little is known about Hélène. Living in Paris during the German occupation, Hélène, a 14-year-old orphaned Jew, worked in the French Resistance. She wore a gloved prosthetic because her right hand was missing. As a resistor, she delivered coded letters and book bombs, easily walking unnoticed through crowds of German soldiers. Youth was her most potent disguise. After an explosion, she often returned to the scene, but amid the chaos, the soldiers would demand that she go home. In March 1943, Hélène walked into a crowded café filled with lunching Gestapo. Hidden inside a book in her school satchel was a bomb. As she entered the café and walked toward the toilet, she surveyed the noisy Germans. In the bathroom, she removed her prosthetic thumb to expose a long pin and, with a poke, started the timer. She replaced her thumb, then breathed deeply. She opened the door and walked behind the crowded tables, dipping slightly to stash her satchel. Eager to escape the stench of sauerkraut, she glided out of the café and scampered across the street to a school. After stepping inside a small lobby, she turned to watch the explosion through a large window. Her eyes fell on a young soldier who was following behind her, clutching the satchel. As he pulled the door, she panicked and jammed her prosthetic hand into the door, pinning it shut. Confused, the soldier shouted and banged on the door. Alarmed, the schoolchildren leapt to the window. The bomb exploded. Please note, "Hélène" is in concept stage, still waiting for funding. Prosthetic hands in the 1940s were simple. Hélène’s thumb could be unscrewed to expose a long pin, which she used to set the book bomb timers. French mail was regularly inspected during the Nazi occupation. To avoid detection, simple messages such as times, dates and locations could be sent on the back of stamps, as shown here. Hélène couriered letters like this. Detail of French stamps used during WWII. Sign up to receive occasional news and updates. I respect privacy. I have never and will never share your information.